Woodbridge, United States - February 4, 2019 /MarketersMedia/ — Sought-after adventure and preparedness company, Surviveware, announces its Small First Aid Kit’s 1300th customer review on Amazon. The company offers an excellent safety and preparedness product line tailored for hikers, campers, and adventurers. One of its prominent preparedness essentials is the Small First Aid Kit. Surviveware’s compact kit only weighs one pound which makes it ideal for lightweight packing. Despite its weight, this kit is packed with essential items for a lengthy excursion. Loaded with life-saving items, this first aid kit can help stabilize any wounds before being brought to the hospital, as well as patch up less serious injuries. The kit’s 100 medical provisions were chosen with the user's needs in mind. Containing several types of bandages and adhesives, this small first aid kit also packs items such as steri-strips, gauze swabs, and other supplies that are used to patch-up wounds and abrasions sustained from outdoor trips. Apart from these consumables, Surviveware’s Small First Aid Kit also has tools such as tweezers, shears, steri-strips, triangular bandages, a basic tourniquet, and a removable CPR kit. The kit also holds supplies for relieving insect bites. These items are all stored inside a water-resistant 600D polyester bag, which makes it an ideal item for keeping first aid supplies and tools free from dirt and moisture. It also floats on water. The kit also has organized compartments that keep the provisions in place. An additional layer of protection in the form of housing each item in resealable plastic pouches was added into this life-saving package. These pouches help in keeping the supplies fresh while preventing water or dirt from ruining the items. One of the favorite features of this kit is its MOLLE-friendly straps and clip-on. These straps allow the kit to be attached to any day pack, bicycle, hammock, tent, roll bar, or rucksack. Moreover, it perfectly fits inside glove compartments, cabinets, and office drawers, which helps ensure that everyone can have quick access to these medical items. Surviveware continues to impress its customers with this complete and affordable first aid pack. Mike, an Amazon customer, made it evident in his review how the kit has been a value-add for him: has amazed him through their compact first aid kit. “I had wanted to get a first aid kit to keep in my vehicle, and after shopping around at several sporting and outdoor stores, as well as viewing the different ones online, this is the one I went for. I am trained in first aid through my Boy Scout training, as well as from my multiple years of lifeguard re-certifications. This kit was the one that had items I felt confident that I would know how to use, and not a bunch of extra stuff. The thing that really tipped me in favor of this one was the organization and construction of the bag. Having made my own first aid kits, and owned several others, I was very impressed with how easy it is to locate anything and everything I need, but the real magic comes when putting things back after using them. 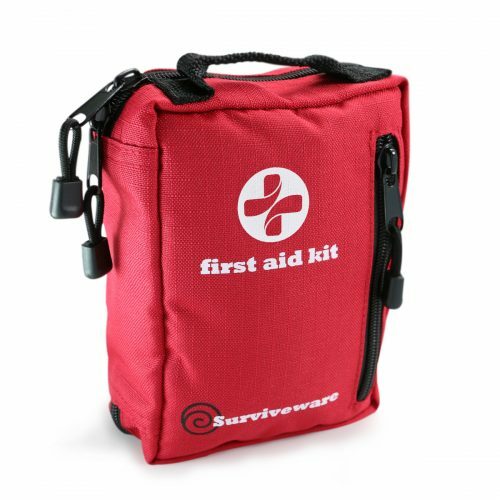 Find out why Surviveware’s Small First Aid Kit is the leading provider of high-quality first aid kits. Order the Surviveware Small First Aid Kit today and enjoy 20% off your purchase by using Surviveware’s Amazon discount coupon. Take advantage of this limited offer. Grab one now by clicking here.